Real estate prices are rising, but buying a home still makes more financial sense than renting. In Honolulu, it's a much closer call. It's 16% cheaper to buy than rent in Hawaii's capital, but once monthly homeowner's association fees (HOAs) are taken into account, the favor swings to tenants as it becomes 1% cheaper to rent, according to Trulia. The median monthly HOA fee in the city is $438, the second highest in the country behind $575 in New York City. San Jose, Calif.; Lancaster, Penn. ; Sacramento, Calif. and San Francisco rounded out the top five markets where buying offers the smallest edge over renting in the country. Californians tend to have a smaller financial gain when it comes to buying a home: six out of the 10 housing markets where buying has the smallest benefit over renting are located in The Golden State, the report showed. Rising home prices bring higher down payment requirements and closing costs, which means buyers in California need to have more cash on hand, said Ralph McLaughlin, housing economist at Trulia. 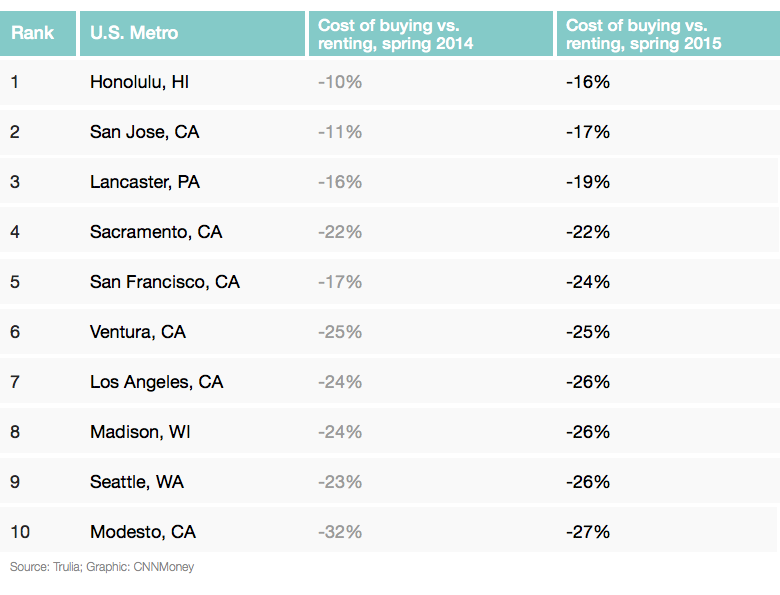 "It would take a lot longer for a homebuyer to break even from the costs." On the other side, buying tends to provide more financial favor to those in the South. Sarasota, Fla., offers the biggest edge to buyers where it's 55% cheaper to buy than rent this year, according to the report. But just because it's cheaper, doesn't mean people are flocking to become homeowners. The homeownership rate fell to 63.7% in the first quarter of 2015, according to Census. Saving for a 20% down payment is a big obstacle, McLaughlin, said. "Even though we are a few years out of the recession, it can still take quite a while to save up for a down payment, especially when rents are high." Low mortgage rates are a key factor in the calculations, and if rates start to rise, some markets could see a shift toward renting, according to McLaughlin, particularly San Jose, Lancaster and Honolulu. "If interest rates make a significant increase, then it will make those market even more attractive to renters because it adds costs to home buying process," he said. The report analyzed the estimated median home value and rent in the 100 biggest housing markets in March and assumed a 3.87% 30-year fixed-rate mortgage with a 20% down payment, itemizing tax deductions at the 25% bracket, and the buyer remaining in the home for seven years.